Perhaps best known for her monumental sculpture of Eleanor Roosevelt, Penelope Jencks has been a professional sculptor for over thirty years. Having studied under several mentors during her career, Penelope has perfected her own unique style. She has created numerous works in terra cotta and bronze, however, currently she spends much of her time living in Italy, where she has her works carved in stone. She is presently working in Italy on a commissioned stone monument of Robert Frost, which will be placed at Amherst College in 2007. Penelope is a member of the National Academy of Design and the Royal British Society of Sculptors. She is also a Fellow of the National Sculpture Society. Her works can be found in private and public collections worldwide. Some of her notable public collections and commissions include: The White House (Washington, D.C.); The Maggie Cancer Care Center (Edinburgh, Scotland); the Readers Digest Corporate Headquarters (Pleasantville, NY); the Boston Public Library (Boston, MA); the Bibliotecca di Pietrasanta (Italy); the City of New York, NY; the City of Toledo, OH; the Cape Museum of Fine Arts (Dennis, MA); the National Academy of Design (New York, NY); Amherst College (Amherst, MA); and Brandeis University (Waltham, MA). 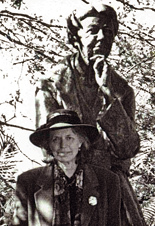 Sculptor Penelope Jencks with her "Eleanor Roosevelt" Monument. Click on a small image below to view larger photographs and learn more information about each work of art. Copyright © 2001 - 2014. Sculptureworks, Inc. All rights reserved.